Somewhere deep inside Symantec, there’s a humming farm of virtual machines whose sole purpose is to crawl 200-plus Android app stores worldwide, download about 10,000 new apps every day, and scan each and every one. They’re looking not just for malware, but for other annoying, privacy-invading things an Android app could do—oh, like take your phone number and send it along to a third party, or grab your camera pictures or contacts. This database of four million scanned Android apps and counting is the foundation of Norton Mobile Insight, the biggest (but not the only) change to the new version of Norton Mobile Security (version 3.4 for iOS/3.5 for Android), announced Wednesday for iOS and Android devices. 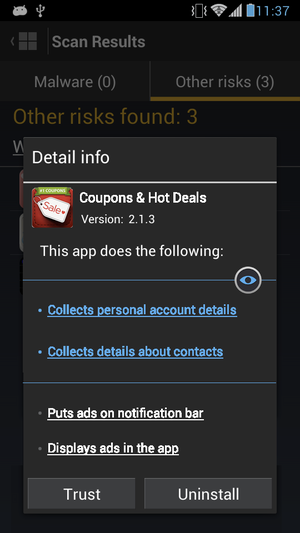 If a Norton Mobile Security user downloads an app that’s been scanned and logged by the Norton Mobile Insight database, the database will send back information about the security and privacy risks for that app. “Even if the app isn’t malware, we try to shed some light on the apps themselves and report back to them whether the app is potentially annoying,” says Con Mallon, senior director of Norton Product Management at Symantec. How annoying and privacy-invading is this Android app? Norton Mobile Insight will tell you. Norton Mobile Insight focuses on the following eight privacy risks—specifically, things an app might collect from your phone: phone number, personal account details, calendar or call log details, camera pictures, SMS messages, or contact details. “We’re trying to call out what we think is most important to the consumer—behaviors that are most egregious,” says Mallon. 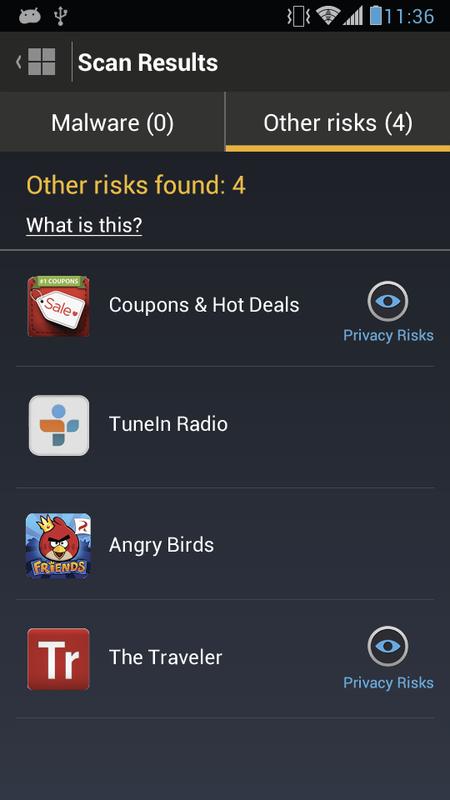 Competitors like McAfee Mobile Security can scan apps on the fly and identify potential risks, but Norton Mobile Insight’s database is a feature unique to Norton Mobile Security. “Giving the consumer some more insight into what the apps are doing is where you’ll see us differentiate ourselves going forward,” says Mallon. Symantec has added a few other notable features to the new version of Norton Mobile Security. The Chrome browser in Android will now enjoy the same protection against malicious Web sites as the native Android browser already has. In addition, the antitheft protection has been expanded beyond iOS devices connected to cellular networks to include Wi-Fi-connected iOS devices such as the iPod touch. You can also set up remote "scream" and remote call for your iOS device from the Norton Mobile Security Web portal, to help you locate the device if it's missing. The new version of Norton Mobile Security is available for a $30 yearly subscription that covers up to 10 iOS or Android devices. Norton Mobile Security requires 15MB of storage space on the device. It works on Android phones (version 2.2 or later) that have Google Play Store installed, and iOS devices running version 5.0 or later.